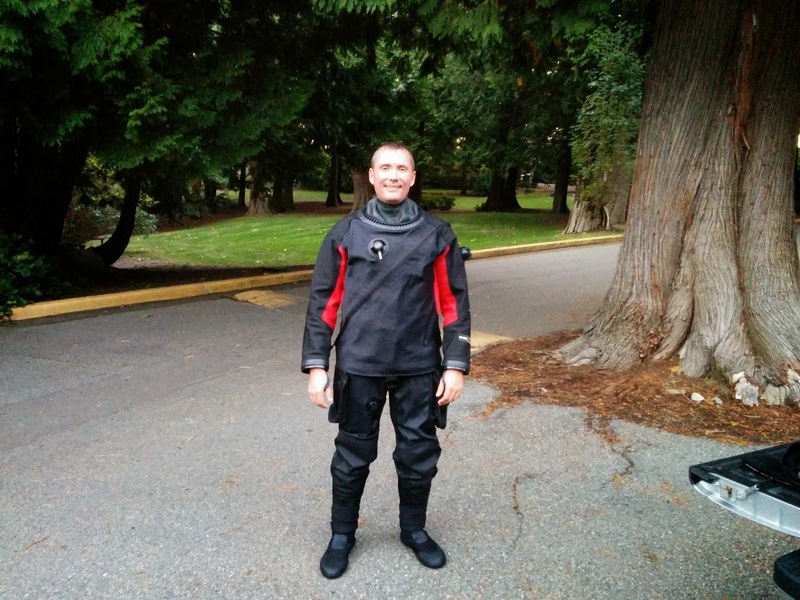 I had planned to try out my new drysuit at the GUE-BC Fall RoundUp, but it didn't work out. So, I decided to go out with Vladimir for a fun scooter dive to try it out. Here was the obligatory glamour shot! On the dive, we had a lot of fun and saw a lot of critters. We scootered out around the plumose garden, up the Cut and then back across to the island and then in. There were many large white nudibranchs, giant plumose anemones, huge cloud sponges, and giant ling cod. There was also a crowd of brown box crabs, maybe about 7 all in one location. They were not big, maybe fist sized. Very interesting to see, you didn't see a lot of brown box crabs at Whytecliff. There were also a huge number of giant coonstripe shrimps and spot prawns, and glass shrimp. On the scooter out, visibility wasn't the greatest and we almost ran over a lion's mane jellyfish. Unfortunately I was hoping to see some dogfish, but that was not to be. At the end of the dive, I did a valve drill in my new suit, and that went ok. Everything seemed to be pretty good. All in all, another great night of diving in BC!